Replacement crank for you 5.0L Ford 302. 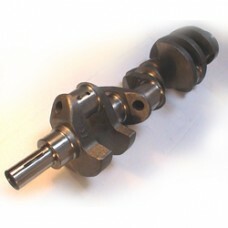 New Eagle cast steel crank with standard 3.00" stroke to suit 50oz 1985 onwards late style 5.0L engines. Cranks are inspected for dimension, size and stroke accuracy and have a journal finish of 6 R.A. or less. Use with stock or Eagle 5.090" rods (EAGSIR50900FP). External balance - for 50oz style damper and flywheel.